Monrovia, Liberia: Just few weeks into the second year of his presidency, Head of State George Manneh Weah is showing all signs of readiness and potency to push his Pro-Poor Agenda for Prosperity and Development (PAPD) to higher frontiers in the New Year. To achieve this strategically and legally, the President has rolled out a number of legislations to underpin and guard the implementation of the flagship development mantra, the PAPD. Delivering his Annual Message Monday, January 28, 2019, the President disclosed that bills to be forwarded to the Legislature for ratification include an Act to Ratify and Authorize the Payment by the Government of Liberia of tuition fees for all undergraduate students in all public universities and colleges; the national youth Act; The Liberia Technical Vocational Education and Training Commission Act and the Revised Liberian Bank for Development and Investment Act. Others are the Act to Ratify the Investment Incentive Agreement between Liberia and Fouta Corporation, Act Ratifying the Agreement for the Establishment of the Export-Import Bank (AFREXIMBANK) and an Act to Amend the Revenue Code of Liberia to reform Excise Tax Law (2018). President Weah also announced a proposed amendment to extend the time required to renew Resident Permits. The President said those who resided in the country for five years or more, without a criminal record, will be eligible under the proposed amendment. The Liberian leader furthered that the administration would implement a Visa-upon-Arrival program, as well as the issuance of Tourist Visas. These bills will serve as addendums to bills President Weah forwarded and passed into law by the National Legislature in the first year of his presidency. They include an Act to Ratify the Financing Agreement to provide additional financing for the West African Power Pool, the Local Government Act of 2018 and an Act to Establish the Land Rights Law of 2018. President Weah said these legislations would help smoothen and enhance efforts toward accomplishing the PAPD launched October 29, 2018 with the aim to give power to the people, better the economy, create jobs, sustain the peace and improve governance and transparency. “The overall objective of the PAPD and its ultimate goal is to lift our people from poverty to prosperity,” the President announced. The President however extolled the national legislature for the critical support and cooperation rendered in passing into law several pieces of legislation totaling 26 he said are relevant to the PAPD. 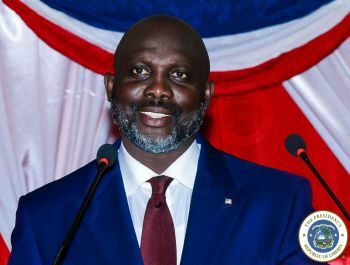 At the same time, President Weah has disclosed his administration would place emphasis on the Agriculture sector as major impetus for economic revitalization. “As we kick-start the infrastructure portion of the PADP through road construction, we also want to place a new emphasis on agriculture,” he said. The Liberian leader vowed to allot the same effort, time and energy to road projects, to programs toward agriculture development. President Weah who says the Agriculture sector accounts for more than seventy percent (70%) of household earnings, indicated that the PAPD can only be sustainably achieved through agriculture. “We will craft new practical and realistic agriculture policies, incentivize the sector by providing access to credit, reducing tariffs on agriculture implements, and provide small machines, modern seeds and fertilizers,” he proclaimed. He reiterated that Liberia is open for business, and that the private sector will be prioritized under his administration.